Always searching for the exceptional, Herrnhuter Sterne Manufaktur collaborates each year with typical Saxon manufactories to create limited editions. With a great love of detail and of Saxon Christmas culture, this collaboration produces extraordinary gift packages whose symbiosis appeals to all the senses. We recommend our limited editions not only as a special gift for loved ones at home, but also for good business customers. Also in 2019, the little A1e Herrnhuter Stern will be available in a special limited edition. What color we present this year, we announce as usual in early May. The special edition 2019 will be available from May 4th to the open day of our Manufactury. This small star (13cm in diameter) comes with a LED (6.3V / 0.3A) and can be operated with a power supply or battery holder, which should be ordered separately. The limited special edition A1e magenta is no longer produced and is available as long as stock lasts! 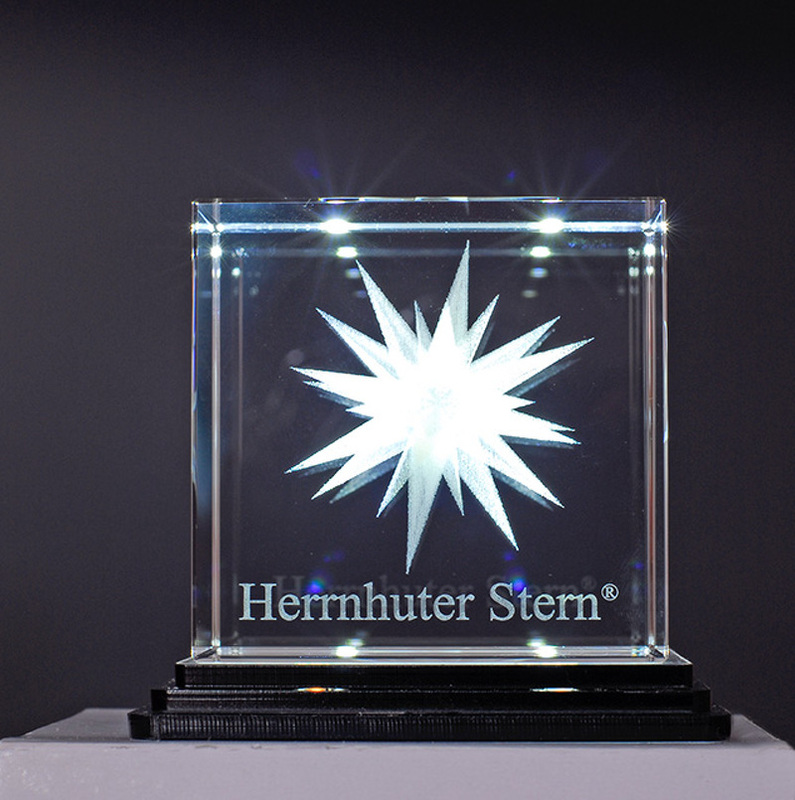 The Herrnhuter Stern in a crystal cube is an excellent eye catcher. The cube, made of solid glass, is polished by hand, individually inspected and captivates thanks to its simple appearance. Special subsurface glass engraving makes the Herrnhuter Stern seem to “hover” in the centre of the glass, and the LED light in the base shows it to best advantage. The base can be individually chosen and comes with white, red or blue lighting. 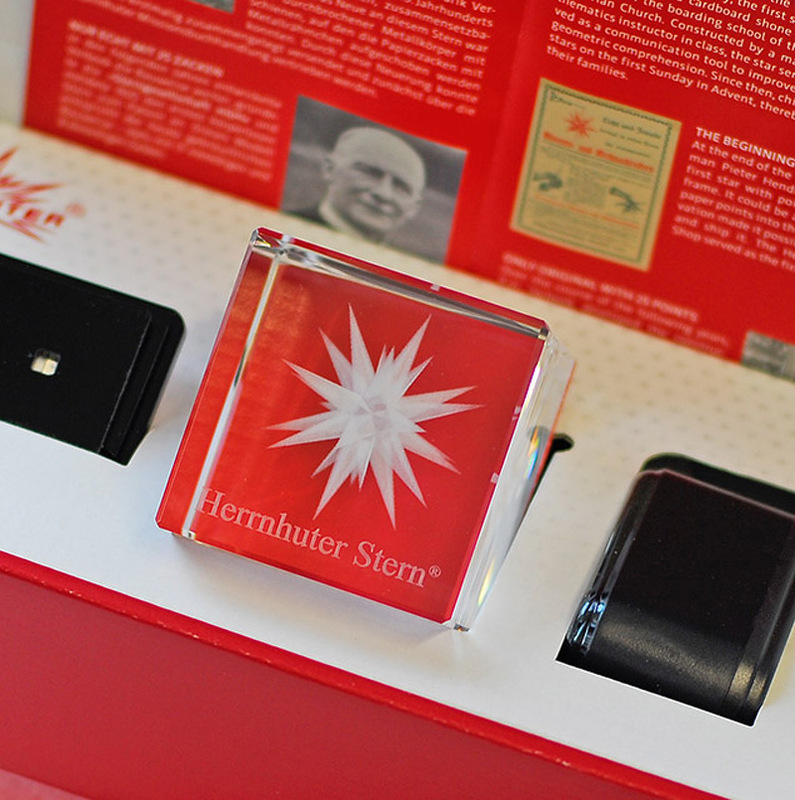 This Herrnhuter® Weihnachtstasse supplements the range of Herrnhuter Sterne. Provided with a striking Herrnhuter Stern in relief, the Herrnhuter® Weihnachtstasse is a small but superior gift made of high-quality porcelain manufactured in Upper Lusatia. 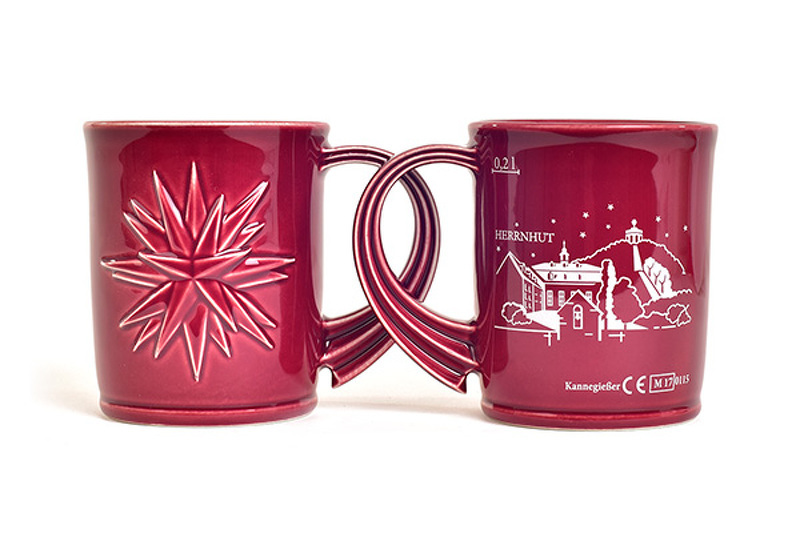 The “Weihnachtstasse” comes with either a “logo” or “Herrnhut town silhouette” motif. 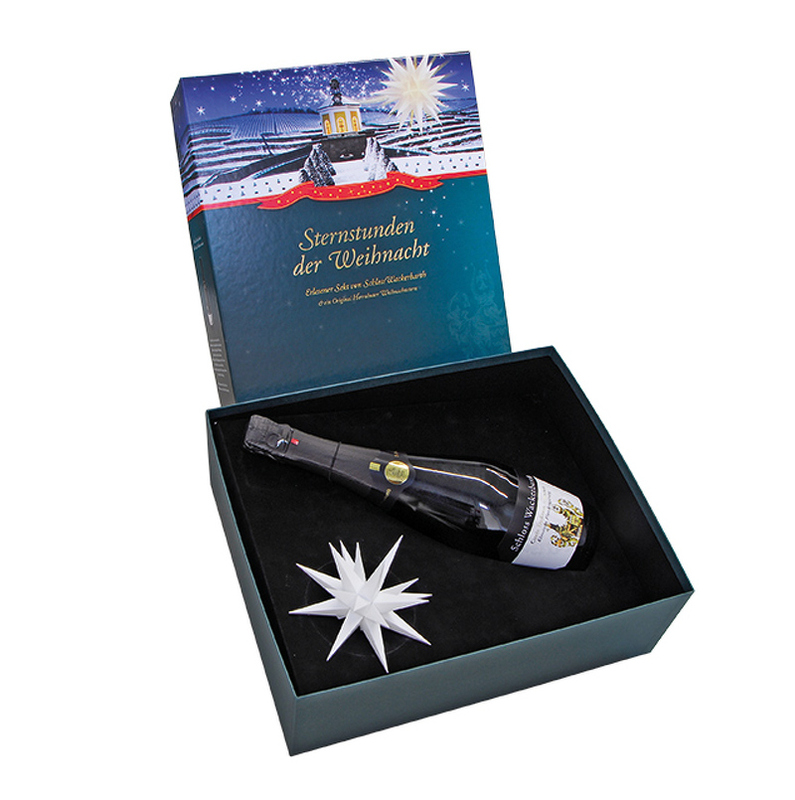 This gift package contains a small, white plastic Herrnhuter Stern (13cm Ø) and the appropriate mains adapter, as well as a bottle of choice sparkling wine from Schloss Wackerbarth castle vineyard, Saxony’s oldest sparkling wine producer. You will enjoy choice sparkling wine, composed of select Saxon grapes from the royal vineyards and refined with the best Auslese wines. Our limited edition from these two manufactories speaks for itself and is ideal for those who like to please all the senses. 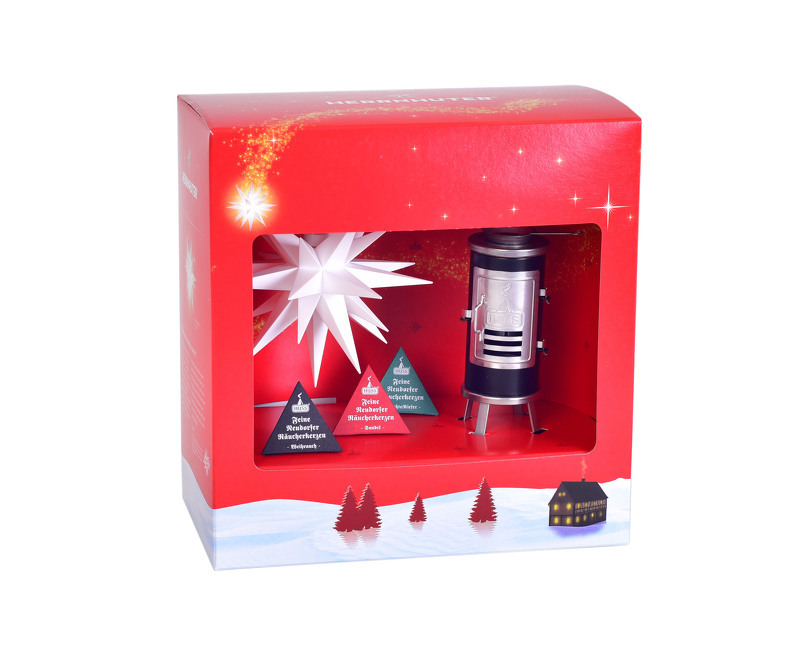 This gift package contains a small, white plastic Herrnhuter Stern (13 cm Ø) as well as the appropriate mains adapter, and a miniature edition of a glue heater including incense cones. Choose your favourite from the three scents supplied – sandalwood, frankincense or fir/pine – and enjoy the festive Christmas ambience. Our limited edition speaks for itself and is perfect for lovers of Saxon Christmas culture.